It’s one of the most frustrating aspects of genealogical research: knowing that an ancestor was adopted and not being able to find the records. The answer is: probably nothing wrong at all. There may not be any records to find — or they may not be accessible. 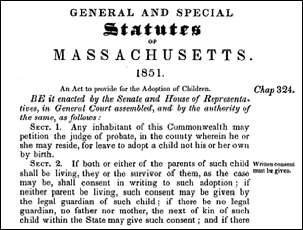 Formal adoptions didn’t generally begin in the United States until the 1850s, when Massachusetts adopted the first modern adoption law. Informal adoption by relatives continued to be common until the 20th century. So… we start with the fact that before the 1850s, there aren’t going to be any records of legal adoption at all. How do we know what the law is on access to records? There’s a good website for a quick review of current adoption statutes in the United States, including records access laws, kept by the U.S. Department of Health & Human Services at its Child Welfare Information Gateway website of the (https://www.childwelfare.gov/). Under the State Resources menu, choose State Statutes and then scroll down to Adoption topics and choose the specific subtopics to search. Another option is the American Adoption Congress website. And remember: whenever a child was or may have been illegitimate, we want to be sure to search for records in the surname of the mother, not just the surname of the man who was thought to be the father. This is especially true for birth and church records, such as baptisms. It’s often a difficult task, tracking down those children in our family histories who seem to have been lost. The records may be hidden in some way, or recorded where we don’t expect them to be. And whether there are records at all may be simply a matter of time. Many states are moving to make more information available to adult adoptees now. Thanks for this link. I need help trying to get some records. My “parents” were declined to be allowed to adopt a child by the state of NY. They went through an authorized foster caring agency who signed an agreement with nyc social services to provide foster care to ny children. I was handed over to this family. Eventually they left NY and NY lost track of me. I thought I was adopted until not long ago the 1st deputy commissioner finally wrote me a letter. I was an aged out foster child. I had recd a notice from DMV in Fl -that I didnt have a birth certificate.we went to the courts and acs looking for the amended records. There was no proof I was adopted. It took almost 4 yrs to get them to admit I was a foster child and just as long to get my original birth certificate.NY made me go to a,FL to do a name change to match the birth certificate and add a first name. They even added my biological fathers name. It was weird because my legal name was Allie and I lived with an Alias and fraudlent ss number for over 40 yrs. I lost a lot with all this, I got my b/c but because they say formally know as- its caused a lot of problems. Ocfs and ss said I had my own social security number (checks were paid on me until I aged out). I have provided all the documents, but they said they will wrap the fraudulent number with my name. Not give me the one thats mine. Any suggestions on getting more documents? Also I have been trying to obtain the contract for the purchase of foster caring agencies- to show that the agency reported to acs and ocfs is part of this. 4 yrs is long enough- I need this fixed. If anyone can help me please. No-one except a lawyer can really assist you at this point. You need to consult with an attorney licensed to practice in both NY and FL. If a formal adoption was reported as a court case before the adoption files were sealed, would it be indexed as “In re: (birth name of child)” in the court docket? I’m guessing that the courts would not have gone back and pulled all the prior adoption cases once the law was changed to close adoption records. This topic’s relevant to my family. My mother had an aunt who was a nurse, heading a Seattle hospital. In 1928 she and her husband adopted a girl born in that hospital, naming her Carol. I’ve found Carol’s birth certificate, naming only the adoptive parents, as Washington state law requires. I knew her well, though I was younger. Around 1960 she married a Peruvian man, moving there. Correspondence with her US relatives persisted for a couple of decades, and we knew she had two sons and an adopted daughter. About 12-14 years ago, through FamilySearch, I found the birth registrations of the sons, but nothing on the daughter. I posted on the Peru Rootsweb list. A decade later, I got a response from a granddaughter of Carol’s. This woman’s English, however, was very limited. I know no Spanish. Our communication didn’t go well. Later I got an email from one of Carol’s sons, whose English was no better. Then I got a letter from Carol’s husband. His English was worse! He did say that in the mid 1960s, the family came to Seattle to visit, including to see Carol’s sister. To the best of my knowledge, Carol was an only child. Everyone here who would remember is gone now. How would I go about finding the “sister?” She’s not in the 1930 or 1940 census. I can’t find a birth certificate for her. My other issue is that I have no idea of her family in Peru knows that Carol was adopted, or if it would upset them to know. Her husband did tell me her death date–I didn’t know whether she was still alive. I think I should ask Carol’s husband to write me in Spanish, as I know people who lived in Latin America and have said they’d try to translate a letter for me. His letter in English is very garbled. Thanks for tackling this large issue of adoption, Judy! Getting as much information as possible from the family first is the way to go. Yes, get the family to write in Spanish and get their info translated. Did you know there’s APP’s that you can get that will translate in real time as you’re texting & on some of the social websites instant messaging? Can also use them for translations of emails. I’d love to recommend the one I used to use however it’s been years. Some are better than others. I know google translate I’ve used for short phrases or paragraphs & it’s usually great (as I’ve asked friends if translation is accurate). Some will even offer language translation for specific dialect’s &/or slang. I am in a search for a family members bio family as well,since there’s not alot of people to ask & she has passed, I feel your frustration. At least you’ve got as far as you have. Don’t give up! My feeling is they were trying desperately to communicate & help you. Maybe look into some APPs or even PC programs available, & contact them again. They may understand you better than they can communicate…worth a try. I really hope you haven’t given up. God bless & good luck. Another place to look is in deed books. In Texas, adoptions were recorded in deed books from 1850 to 1931. The 1889 adoption that I found in a Texas deed book listed the child’s name where the description of the property would usually be put. The grantor was the biological father and the grantee was the adoptive father. I understand that adoptions were recorded in this manner in some other states, as well. I was adopted in October 1978. My adoption took place in the State of New York.Do anyone know about New York State passing the law to open up closed adoption??? New York is … um … very backward when it comes to this sort of thing. I wouldn’t expect any movement to open records in New York any time soon. My grandmother was adopted twice (the first adoption was reneged after the couple divorced two years after it was finalized) in Massachusetts in 1904. Because she knew the names of her biological parents and had her adoptions papers it should have been an easy task in solving her parentage, surviving birth family, and their history. but it wasn’t. Unfortunately, my grandmother didn’t share her knowledge with the family. Although a few members might have known some helpful information, they were mostly long dead. So, I basically had to start from scratch. I took what little I did know at the time (her biological surname and her birth date, as well as the city in which she was born, and simply called the town records clerk. The clerk was absolutely wonderful! She told e to hold on and then went through the birth certificates and quickly located my grandmother’s original birth certificate! Apparently it wasn’t the practice to seal them in an adoption file back in those days. That was 20 years ago. Back then the internet was still quite new and I was struggling to learn how to access it and how to conduct a good genealogical research. Although I discovered much during the early years, it did take me four years before I was able to locate surviving family members of one sibling. Luckily for me that person knew a lot about the situation as her mother (my grandmother’s sister) shared a lot with her and also because my great grandfather lived with them until his death in 1947. She shared pictures, stories, letters and articles with me. It was an amazing genealogical boon and it was so wonderful to finally connect the dots of what happened to my grandmother’s family. But … the rest of the siblings remained a mystery until i finally subscribed to ancestry. That was a fantastic boost to my research! I encourage everyone to get their DNA tested. as soon as you get the results you’ll figure out who you are; the chances are great that someone’s DNA will be a good match. Today, I am reunited with cousins of my grandmother’s siblings. it’s such a gratifying and inspiring ending to our adoption story. Unfortunately there is still one sibling, a brother, missing. 20 years later, i still can’t find him anywhere. I know he survived into his adulthood because i have two letters from Seattle Washington that were from him to my grandmother’s sister. Although there are several good clues in the contents of that letter, there is no address on the envelop so I have no idea if he was also adopted and if his surname was changed. I suspect he was as I have never found him on any census. Good luck in finding the missing sibling or his descendants. Aw, thanks, Judy! good luck with your research too!